It can be extremely frustrating when you've just had a gel manicure and then you accidentally stain your nails. Whether the stain is food, pens, or hair dye, there are many ways you can quickly and efficiently remove stains that will leave you with gorgeous, clean nails again. For pesky pen stains, follow either of the below methods. Grab some rubbing alcohol and a cotton pad. Soak one side of your cotton pad with the rubbing alcohol. Swipe the cotton pad over each nail to remove the pen. Dip a Q-tip in nail polish remover. Swipe it lightly over the pen mark until it disappears. It's important not to use too much product in this case as this could ruin your gel nails even more than the stain. 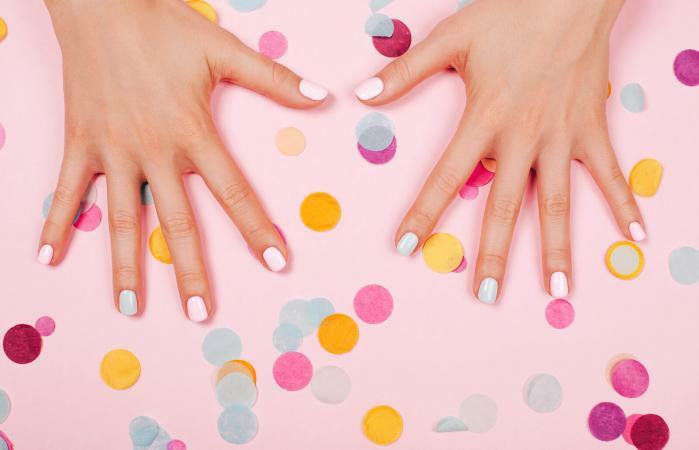 It's easy to stain your gel nails with hair dye if you're doing a DIY coloring job; however, there are two simple ways you can remove these stains. Rub it over your nail as many times as necessary to lift the stain. Grab some hair spray and some cotton pads. Spray directly onto each affected nail. Rub gently with a cotton pad until the stains disappear. Cooking curries with spices like turmeric can often cause your gel nails to discolor. There are a few different ways you can remove food stains in a quick and straightforward manner. Put one tablespoon of sugar scrub in a bowl. Mix the two ingredients together. Apply the scrub to your stained nails. Rub the stains until they come off. Another effective method of removing food stains is to use coconut or castor oil. Soak it in coconut or castor oil. Rub it over your stained nails until they're completely clean. Shaving cream contains hydrogen peroxide, which serves as a bleaching agent to counteract dark stains. Cover a cotton ball in shaving cream. Wipe the cotton ball over the stained nail. Keep repeating the process until the stains are gone. Baking soda is an absorbent, mild abrasive bleaching agent that, when coupled with lemon juice, tackles stains fast. Put two tablespoons of baking soda into a bowl. Add one tablespoon of water and a few drops of lemon juice. Mix the ingredients together until it resembles thick icing sugar. Dip a cotton pad into the mixture and start rubbing your stained nails. Don't stop until the stains have lifted. Put one tablespoon of apple cider vinegar into a bowl. Soak a cotton ball with the mixture. Rub it over your nails until the stains have gone. Sometimes the indigo dye from jeans or denim jackets can run onto your gel nails. In this case, you need to use products that contain a whitening agent to reverse the discoloration effect. Some of the above methods for hair dye or food stains can also work for denim dye stains. If they don't, try the following tips instead. Hand sanitizer has a high concentration of alcohol, which is extremely effective at removing ink and dye stains. Dip a nail brush in hand sanitizer. Scrub the stained nail until it's good as new. It sounds unusual, but denture tablets are proven to work in this instance as they also have whitening agents. Dissolve a denture tablet into a bowl of warm water. Soak your nails in it for three to five minutes for best results. Last but not least, you can try whitening toothpaste for denim dye stains. Apply the toothpaste to a cotton pad. Rub it over your stained nails until the stains lift. Whatever the stain, it is possible to remove it from your gel nails if you persevere and try different options. If all the previous methods fail and you've tried and tried but you just can't get rid of the stain, perhaps it's time to redo the nail or visit a manicurist. However, make sure that you've experimented with each method at least twice on separate occasions before you give up. Sometimes doing the method once only lifts the stain slightly but then, once you attempt it again at a later time, you find that the stain completely disappears.